Ah, tower defense games, some days I just can’t decide if I love them or really hate them Seriously, I can’t tell you how many times I’ve given up sleep all because I just could not stop playing. “Just one more level” I tell myself, but before I know it, it’s 3 in the morning and I’m yelling at the screen because my ice tower isn’t upgrading fast enough and the stupid bombs are too expensive. But where were we…? Oh, right, TowerMadness! Protect the sheep from alien abductors! It’s about what you’d expect, but it does have a couple of interesting features. First off, the 3D engine isn’t too shabby. The graphics are a little on the blocky side, but the design is charming, and the game runs smoothly. Second, it has a freeform map, so you can design your own path, and you have only yourself to blame when it falls to pieces (*sob* My poor sheep!). Third, you have the option to pinch zoom, which was sort of a non-feature for me, but I can see how it might be useful, especially on the later levels when the action is hot and heavy. I would have liked a bit more variety in the weapon designs, since I occasionally found it hard to keep track of which towers I had upgraded unless I zoomed really far in, but it wasn’t that much of an ordeal. What I found a little more annoying was trying to figure out what weapons did what, since there is no handy way to see a description during the middle of a level. To see a description, you have to pause the game and go into their “Towerpedia”, which, I have to admit, is pretty impressive. The Towerpedia is chock full of tables that would tell you things like cost of upgrades, range, damage, attack speed, and “bang for your buck”, something I appreciated as a geek, but I worry that it actually spells things out a little too much. Part of the joy of tower defense games is the agony of uncertainty ( “Am I gonna make it? Argh, I can’t handle the pressure!”), so it would have been nice to get the quick and dirty version (“Okay, lasers good for flying types, go!”), instead of the number overload, especially when I’ve got hordes of intergalactic sheep rustlers bearing down on me. Still, I enjoyed TowerMadness, and for the price, it’s not a bad little game. 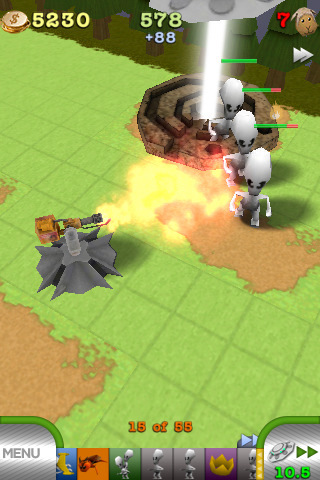 It’s not Plants Vs. Zombies, but if you’re a fan of tower defense, it’s still worth a try. AppSafari review of TowerMadness was written by Tracy Yonemoto on March 29th, 2010 and categorized under App Store, Fun, Games, Tower Defense. Page viewed 3486 times, 1 so far today. Need help on using these apps? Please read the Help Page.